Under the assault of radical Islam, French civilization is eroding from within. And there are now large parts of French culture which are openly adding water to the mill of Islam. These have been just called by Le Figaro, “agents of influence of Islam”. Intellectuals, journalists, politicians, those who consider the Muslims “the new oppressed”. “They are those who believe that Islam is a religion of peace, tolerance and love and do not want to hear about an Islam of war, intolerance and hatred”. — Michel Onfray, Le Figaro. In short, France needs to start fostering its side of this cultural war. Even if it is too late to recover all of the lost ground, if France does not start immediately but just limits itself to “manage” this “state of emergency”, the lights turned off will not be only those of the Eiffel Tower, as happens after every terror attack, but also the lights of one of the greatest civilizations that history ever gave us. Although some scholars, such as Gilles Kepel, estimate that a “civil war” could break out in the future, there is a more realistic scenario: a country split along demographic and religious lines — the secular French republic vs. the Islamic enclaves, the “French 100 Molenbeeks“, from the name of Brussels’ jihadist nest. France used to be regarded as a jewel of civilization. One of France’s great intellectuals, Alain Finkielkraut, recently said: “France has become for me a physical country, since its disappearance has entered into the order of the possibilities”. Finkielkraut, a member of French civilization’s holiest shrine, the Académie Française, was not thinking about the physical disappearance of French bakeries, boutiques or boulevards; he seemed rather to mean the disappearance of France as the capital of Western culture. “They are those who believe that Islam is a religion of peace, tolerance and love and do not want to hear about an Islam of war, intolerance and hatred… The collaborator wants to see only the first [type of] Islam by believing that the second has nothing to do with Islam. These collaborators are the Islamo-leftists”. How can France prevent an Islamic takeover of parts of the country with fatal metastases for the entire European continent? “In order to disarm terrorists, we must disarm consciences”, Damien Le Guay just wrote in a new book, entitled La guerre civile qui vient est déjà là (“The Coming Civil War Is Here Already”). France needs to stop talking with “non-violent Islamists”, such as the Muslim Brotherhood, and instead to speak with the true liberal reformers, the internal dissidents of Islam. The daily newspaper Le Figaro recently devoted an entire issue to Muslim women in France who are trying to fight radical Islam. They are journalists, activists and writers who want equality between men and women, freedom of expression and sexual freedom. These Muslims clearly care more about the French Enlightenment than many non-Muslims who advocate appeasing Islamists. France needs to close the Salafist mosques and ban the preaching of radical imams who incite Muslim communities against the “infidels” and urge Muslims to separate from the rest of the population. France needs to tighten its alliance with Israel, the one outpost of Western culture in a region that has rejected it. Israel is the West’s only true ally in an area that is collapsing under the weight of radical Islam. France needs to protect and renovate its Christian treasures. A few weeks ago, the Cathedral of Notre Dame in Paris promoted a fundraising project to save the building from decaying. The French authorities need to play their part and not forsake France’s Christian heritage. France needs to send Islamists the message that France is a secular country, but not a de-Christianized one. After a year of being ruled by Egypt’s former President Mohamed Morsi, the majority of Egyptians turned against the Muslim Brotherhood — a decision that understandably does not sit well with pro-sharia media. These, such as Al Jazeera, are dedicated to trying to save the reputation of the Muslim Brotherhood, sharia and Islam itself, at any cost. Their number-one enemy has become critics of jihad and sharia, especially those who live in Western freedom. The Arab media’s “solution” to a mass defection from extremism is to accuse moderates and critics of sharia not only of being “collaborators” with infidels but also that they “collude” with terrorists. In a chaotic, propaganda-prone area of the world, Qatar’s Al Jazeera has always reported sympathetically about Islamist groups and promoters of sharia, and against moderate Arab leaders. No moderate leader could survive under such conditions. Now that the note supposedly showing “collusion” between the Trump campaign and Russia has been outed by Foreign Policy as mainly an attempted Russian hit-job on William Browder, what is the true threat to the United States? For months, the lawless FBI has snubbing subpoenas (is complying with subpoenas optional? ), and avoiding transparency under Special Counsel Robert Mueller and his equally lawless, crime-“challenged” “investigation.” The true threat to the United states — if not Mueller and the FBI itself — is not the president, his campaign or even the Russians. Moreover, it is not exactly a news-flash that many countries have been spying on one another for ages. “Collusion with Russia” was just the newest dirty word in American politics created by anti-Trump political operatives and the media. It seems intended to confuse the public in order to tarnish Trump’s reputation and bring down his administration. It is an extremely old ruse. Collusion,” or the “appearance of collusion,” has been a common fear tactic used by Arab media for centuries. Fear tactics are the only solution in cultures that refuse to deal with the truth in the open. The major red line that no citizen of a totalitarian system can ever cross is engaging in behavior that might bring about an accusation of “collusion” — collaboration with enemies or perceived enemies. Arab citizens have learned to avoid any contacts, friendships, communication, shaking hands or even being in the same room with “undesirable” enemies of the state. Try asking any Arab diplomat on how he or she acts and feels in the presence of an Israeli official. For decades, when Israeli officials gave speeches in the United Nations, Arabs left the room. After a visit to the United Kingdom in my youth, after innocently telling a journalist college friend that I had met Jews in the UK and could not believe how nice they were, her response was: “You know what happens to those who collude with Jews? They come back to Egypt in a box.” Shortly after, when a few of us teenagers, speaking English combined with some French and Arabic — not uncommon among some Cairo residents — were stopped in a village on the way from Cairo to Alexandria, the villagers called us Jews and the police were called. It took a while to get out of that mess. Reality, finally, has hit Egypt. Its enemies’ list had to change in the face of the constant challenge to the stability of moderate governments. The true threat to stable Arab governments, as Egypt is realizing, is not Israel; it is political Islam from groups such as the Muslim Brotherhood, ISIS, and so on. This real threat has become a terrible burden to every Muslim head of state and is behind all the political chaos, coups and revolutions currently raging throughout the Islamic world. After Trump’s visit to Saudi Arabia, Arab nations developed the courage to demand shutting down Al Jazeera headquarters in Qatar. In a chaotic, propaganda-prone area of the world, Qatar’s Al Jazeera has always reported sympathetically about Islamist groups and promoters of sharia, and against moderate Arab leaders. In an atmosphere such as that, no moderate Muslim leader is able to bring his nation out from under the coercion of jihadist terror and sharia tyranny. Every Arab leader knows that to bring modernity and serious reformation would be considered a violation of sharia. Islamists are not only feared because of their promotion of terror, but they are also considered the guardians of sharia. Islamic law dictates that every Muslim head of state must rule by sharia, wage jihad against non-Muslim nations and never allow himself or his citizens to collude with, or seek peace with, Islam’s enemies. No moderate leader could survive under such conditions. King Salman of Saudi Arabia is to be commended for finally issuing a decree that allows half the population of his country, women, to obtain the paperwork to drive — but they usually still need permission from a male guardian to leave the home alone. As the last thing the Muslim public is ready for is the truth, convoluted games and accusations are the only way that many Arab leaders think they can preserve their legitimacy. The war between moderates, who want less sharia, and Islamists, who want full sharia, consists — regardless of “truth” — of winning over the average Arab citizen and leading him to believe that they represent the “real Islam”. All sides thereby play the game of “collusion”. When Islamists accuse moderate leaders of collusion with the West, moderates respond by accusing Islamists of being the creation of the West. On many Arab media outlets, ISIS is the creation of the West (as was Al-Qaeda before it). As a moderate Arab leader, it is therefore not easy to survive without the constant threat of an Islamist uprising. President Abdel Fattah el-Sisi of Egypt and King Abdullah of Jordan are considered moderate leaders, and many want them to stay that way, but the pressure from Islamists is immense. Recently Sisi said that he wants to promote a new form of fear, a “phobia against bringing down the State.” One can sympathize with his attempt to put into words the obstacles to governing in a majority Muslim nation. Sisi seems to want to encourage Egyptians to develop a fear of succumbing to radical propaganda that aims to bring down moderate governments. What he seems to be telling Egyptians is that revolutions, coups d’état and assassinations are not the solution to every problem but rather, it is — or should be — the ballot box. A prominent Egyptian magazine, Rose El Youssef, in 2007, falsely portrayed Dr. Wafa Sultan and this author in their front-page as “alt-jihadists” — collaborators with the Taliban and the Muslim Brotherhood. Yesterday, a close friend in Egypt sent a warning of rumors in the Egyptian media, after the assassination of a journalist by the Muslim Brotherhood, that the Muslim Brotherhood has apostate “collaborators” in the West such as me. This shameless and reckless propaganda is intended to confuse the Egyptian public about who their true enemies and friends really are. It is unfortunate that the tactics of the Arab media — to accuse people of “collusion” in order to silence any opposition — are now moving into US mainstream media regarding Trump and Russia, which the US media regard as their new “enemies” — the same media that defends sharia law, Islam and Islamic terrorism in the West. It’s not uncommon for members of an immigrant community to mourn a prominent figure from their homelands. But Akef led a religious movement which seeks global dominance and which cultivated an Islamist ideology that inspires Sunni terrorist groups throughout the world. His U.S.-based mourners can continue trying to deny their Brotherhood affinity, but actions speak louder than words. If the leader you pray God places “in the higher paradise with the prophets, the pious, and the martyrs” led a global Islamist movement, sanctioned terrorism and served in a secretive, violent Brotherhood branch, you’ve tipped your hand. A number of U.S.-based Muslim group leaders who vehemently reject evidence connecting them to the Egyptian Muslim Brotherhood in public made a point of publicly mourning the group’s former spiritual guide, who died in prison Friday. “What kind of tyrannical regime would imprison a sick 90 years old man?” Council on American-Islamic Relations (CAIR) co-founder and Executive Director Nihad Awad wrote Saturday after Brotherhood Supreme Guide Mohamed Akef’s death. “Who resisted the colonizer, and raised generations on righteousness and the love of their country? #Mahdi_Akef, consider not Allah to be oblivious.” His Twitter post was in Arabic, so many of Awad’s U.S. followers may not have appreciated its significance. Esam Omeish, a past Muslim American Society president who serves on the board of Northern Virginia’s Dar Al-Hijrah mosque, along with a fellow board member, are among the religious leaders and political activists who publicly eulogized the Brotherhood’s leader. In addition to running an organization which ultimately seeks a global Islamic government, Akef left a long history of extreme rhetoric that his mourners didn’t mention. Akef led the Muslim Brotherhood from 2004-2010. During his tenure, all members had to swear a religious oath of allegiance to him known as bayah. As supreme guide, his word was absolute for members. He signed a 2004 fatwa written by Brotherhood spiritual leader Yusuf al-Qaradawi which said Muslims had “an obligation … to kill American citizens in Iraq, since they are in Iraq in order to assist the soldiers and the occupation forces; it is forbidden however to desecrate their corpses.” Bombings against American soldiers in Iraq and against Israelis in the Palestinian territories were “religious obligation[s],” Akef said months before signing that fatwa during an interview with Egypt’s Al-Arabi newspaper that was translated by the Middle East Media Research Institute (MEMRI). He rejected calling Osama bin Laden a terrorist, saying the al-Qaida leader was “without a shadow of a doubt – a jihad fighter. I do not doubt the fact that he opposes occupation, nor that he does this in order to get closer to Allah, may He be praised and extolled,” Akef said in a 2008 interview with the website Elaph.com. Akef was just 12 years old when he joined the Muslim Brotherhood in 1940. He worked closely with founder Hasan Al-Banna and spent more than 20 years in Egyptian prisons. Akef joined the Muslim Brotherhood’s “secret apparatus” that was involved in bombings and assassinations in the late 1940s. Omeish acknowledged his past Brotherhood membership during a 2011 talk at American University, calling it a “wonderful experience.” He also lavished praise on the Muslim Brotherhood last December in another Facebook post. Similarly, this was not Awad’s first time toeing the Muslim Brotherhood party line. “We congratulate the Egyptian people and their new president on this great achievement in Egypt’s struggle for freedom,” Awad said after the Brotherhood’s 2012 election victory in Egypt. Other CAIR leaders defended the Muslim Brotherhood on social media against claims it engaged in authoritarian tactics before it fell from power in July 2013. Awad also defended Turkey following last year’s failed coup despite Islamist President Tayyip Recep Erdogan’s transformation of his country into a police state where dissent is illegal. Awad’s past membership in the Muslim Brotherhood is documented in internal records seized by the FBI. A telephone list places Awad on the Brotherhood’s Palestine Committee, which was tasked with providing political and financial support for Hamas in the United States. Another pro-Brotherhood individual who serves with Omeish on the Dar Al-Hijrah board eulogized Akef. Akram Elzend, a co-founder of the Muslim Brotherhood-linked Egyptian Americans for Democracy and Human Rights (EADHR), posted his own tribute to Akef on Facebook: “The Sheikh of the Mujahidin has died #Farewell_Akif,” Elzend wrote. Elzend also alluded to supporting the Muslim Brotherhood in a March 2015 Facebook post emblazoned with the Brotherhood’s crossed sword-logo that linked to an article written by the group’s spokesman vowing to “liberate Egypt from the grip of this bloody coup.” EADHR co-founder Hany Saqr eulogized Akef as someone who could not be described with words. “May Allah repose the martyr Mr. Mohamed Mahdi Akef and elevate him in the higher paradise and make his blood be upon them who did him injustice,” Saqr wrote on Facebook. Those internal Palestine Committee records which tie Awad to the Brotherhood network also identify Saqr as a onetime “Masul” or leader of the American Brotherhood’s Administrative Office for East America. “May Allah repose Akef and all the martyrs of injustice in Egypt; may Allah curse their killers, those who enslave Egypt and their supporters, may Allah reward the liked of Habib according to their malicious acts,” Abu Irshaid wrote. Abu Irshaid has his own past connection with a Palestine Committee entity. He served as editor of Al-Zaitounah, a pro-Hamas Arabic periodical published by the now-defunct Islamic Association for Palestine (IAP). IAP was the Palestine Committee’s propaganda arm. 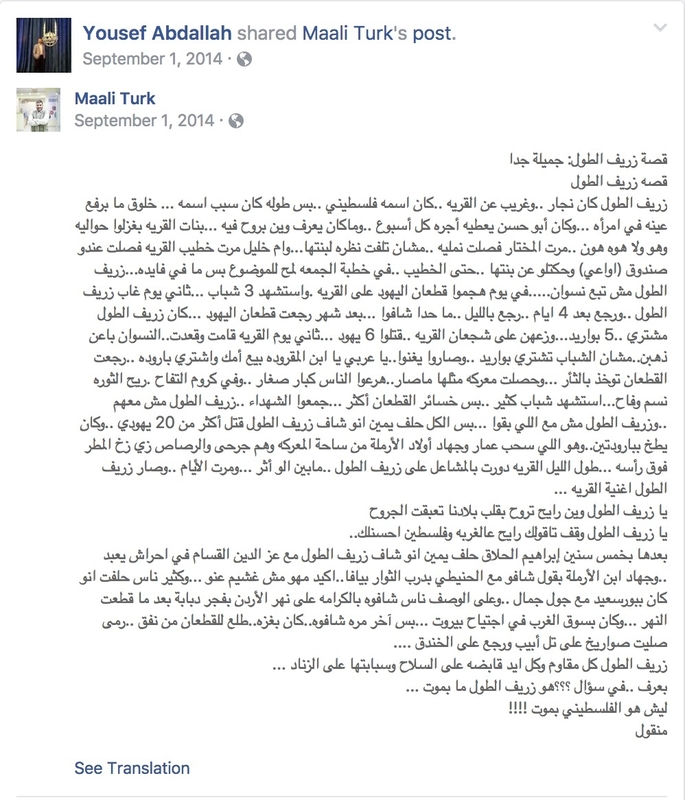 Elkadi made several other Facebook posts mourning Akef. EAFJ spokesman Mahmoud ElSharkawy hailed Akef as the “sheikh of the revolutionaries” who was martyred while in prison. “May Allah rest the soul of the captive and the martyr, and we ask Allah to grant us the best of end on the path of truth and martyr without any alteration,” ElSharkawy wrote. Elkadi and ElSharkawy’s support for Brotherhood-linked Egyptian terrorists is made clear by their numerous social media posts. Formal memorial services for Akef were arranged by EAFJ-linked people in New York and in New Jersey. A banner at the New Jersey event called Akef the “Sheikh of the Mujahideen” in Arabic and described him as a martyr in both English and Arabic. EAFJ co-founder Sheikh Mohamed Elbar of Brooklyn’s Islamic Center of Bay Ridge eulogized Akef as a martyr and a “mujahid” or holy warrior. Elbar belongs to the International Union of Muslim Scholars headed by Qaradawi, the Muslim Brotherhood ideologue and EAFJ co-founder. “We ask Almighty Allah to elevate Mahdi Akef to the ranks of the martyrs … Oh Allah, he died as a Mujahid for your cause, so grant him the status of the Mujahideen,” Elbar said. Elbar’s mosque held a separate memorial service for Akef.